The HJ-4NP is a metal anti-static connector set that creates a three-pipe intersection on two axes. This connector is the best option when you need to create separations without damaging the structural rigidity of some pipes. The HJ-4NP is the last of the four most used Flexpipe joints. 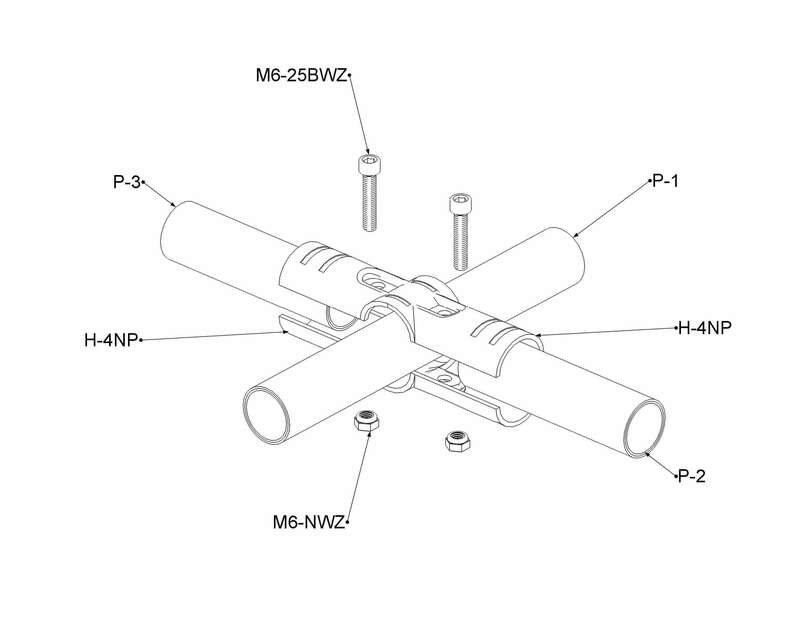 To create an HJ-4NP, you need to regroup two H-4NP together with two M6-25BWZ bolts and two M6-NWZ nuts. Because this connector is the last one with standard application in a majority of structures, you should keep the parts necessary for it. The HJ-4NP will be used mainly in the center of exterior sides. This connector will give you the option of making a pipe grid with fewer tubes than would be required with a wire mesh, which is made with HJ-7NP connectors. This HJ-4NP will also be ideal when you need to create an intersection between two perpendicular pipes, but you don't want to weaken the strength of a long tube or a series of long tubes. The joint also allows you to secure a stamp wheel easily at the bottom center of the structure. This connector is one of the easiest to connect along with the HJ-1NP. The HJ-4NP is equipped with twelve striations for grip and six reinforcement holes for the construction of heavy-duty and structures and protection against frequent vibration. The HJ-4NP is compatible with most 28mm pipe systems and equivalent joints. 2- Take two connectors H-4NP and group them around the P1 pipe. 3-Take two M6-25BWZ bolts and two M6-NWZ nuts and insert them into the corresponding openings. Make sure to put the bolts on the more accessible side. 4- Tighten the M6-25BWZ bolts and nuts M6-NWZ together a few threads , but no more. 5- Insert the P2 and P3 pipes within the HJ-4NP between the first and second guides as shown in the plan . 6- Tighten completely the M6-25BWZ bolts and M6-NWZ nuts together until the HJ-4NP attached firmly to the three pipes . A force of 9.8 Nm is recommended for this step.